A spider spins its web on an apple tree. Three different phases of the process are projected at three spatial planes. 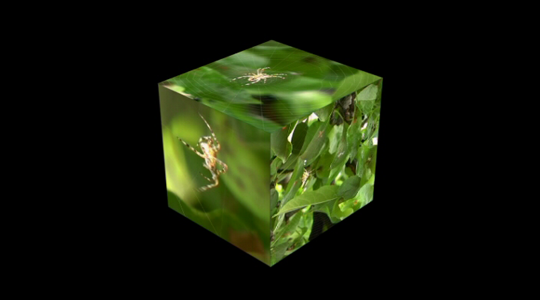 Altogether a cube appears. The simplicity of the well-known natural scene is complemented with architectural abstraction. The video combines the power of unconscious nature with the symbol of human imagination as a strong emotional mixture. Made with support from Intermodem.